When building a collection, without a doubt the most important thing is preservation. In the 90's, the "screw case" was the king of cardboard preservation. In the year 2010, the Magnet Case has laid claim to the throne. At first the magnet case is a scary proposition, but it's offers the best presentation and preservation this side of a Beckett Slab. When shopping for a magnet case, your immediate fear is that you will drop the case and it will pop open, in the process sending your prized card into the unknown without any protection. Yes, this can happen, but after opening over 1,000 screw cases over the last few years, it's safer than smashing a card to death inside a 4-screw tomb. When brands like Topps Finest and Bowman's Best came out in the 90's, many cards were screwed into cases meant for much thinner stock. Even if you put a 90's Finest in a 35 Point Magnet Case (Smallest), the magnet will give just enough to save the surface of your card. It's usually not even noticeable, but trust me, the magnet is far more forgiving that the screw. Over time, the pressure a screw case can exert on a card can damage the surface and turn subtle imperfections into major ones. In choosing a magnet case, it's important that you find a magnet case that matches the "point" of your card as closely as possible. The word "point" is used in defining the thickness of a card's stock. 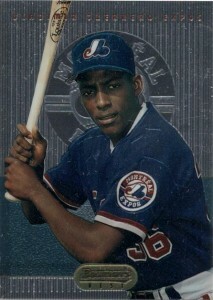 A standard card, such as a regular base Topps uses 25 point stock. The smallest magnet cases are 35 point stock. Usually, a card will fit perfectly in a case if the stock is within +/- 10 to 15 points. 35 Point- This is the most popular and common size. It will fit anything from a base Topps Card to a Topps Chrome card. 55 Point-These are for cards that are a tad thicker than Topps Chrome. They are primarily used for thick stock base cards and the thinnest relic cards. 80 Point- These are the rarest and least used magnet cases, for whatever reason cards are usually to small or big for these. 100 Point- These fit your standard high-end relic cards. I find that SP Authentic and Triple Threads Patch Autos fit perfectly in these. In my opinion, a snug fit is always better than a loose one. 130 Point- These are for the extremely thick Jersey Cards. Thick Jersey Cards usually contain a "patch" rather than a "swatch". A "patch" is a thick jersey piece that contains a multi-layered part of a jersey, such as a piece of the number portion of the jersey. 180 Point- These are for the thickest Jersey Cards. Basically, if you pull the thickest card you've ever seen, this is probably the case for that card. Now that you understand the sizes, it's time that I let you in on the secret to alleviating any fear of dropping a magnet case. The Brand "BCW" just happens to make "Team Bags" that fit over a magnet case perfectly. Team bags are meant for a collection of loose singles. 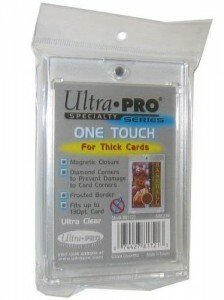 The Ultra Pro ones are a tad too small to fit over a Magnet Case. Not only will the "Team Bag" prevent the card from popping out, they protect the shiny plastic surface of your magnet case. Simply slide the team bag over the case, peel, and seal. I like to put a piece of clear tape over the seal for good measure. *If the card feels a bit loose in the magnet case, laying a Ultra Pro "Vintage Sleeve" over the card inside the case will prevent excess moving. "Vintage Sleeves" are meant for older cards, they are larger and sturdier than standard sleeves, they also work perfectly for sleeving Jersey Cards. Ultra Pro makes the best ones and they can be found at most hobby shops. However, I wouldn't suggest putting one over an Autographed cards. As the sleeve could smudge or take some ink off the card, as sleeves are porous and carry a small amount of moisture. This moisture will not affect the actual card, just the autograph on the cards surface.